There is nothing especially rare about this type of money showing Ben Harrison. The rarity is all based on the condition and bank of issue. Your most generic $5 blue seals are going to sell for around $60. 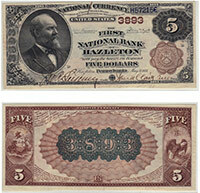 Common but more interesting notes sell for between $100 and $500. The upper end of the market is reserved for the rare stuff; and they can sell for thousands of dollars. The great news is that there are lots of rare banks out there. Many great discoveries are made everyday. Please contact us for pricing details. Don't forget to check the serial number. Number 1 notes always sell for nice premiums.